With the holidays and entertaining season almost upon us (I know, I can barely believe it either…), I’m stocking up on hostess gifts and presents for friends and family. Rather than panic every time I’m running out the door for yet another party, I’ve found that keeping a small arsenal of ready-to-go gifts cuts down on a ton of stress. 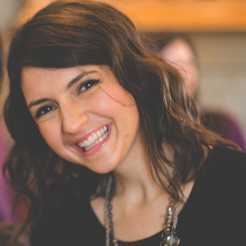 I love a good DIY hostess gift, but there’s rarely one my kids can help me with. 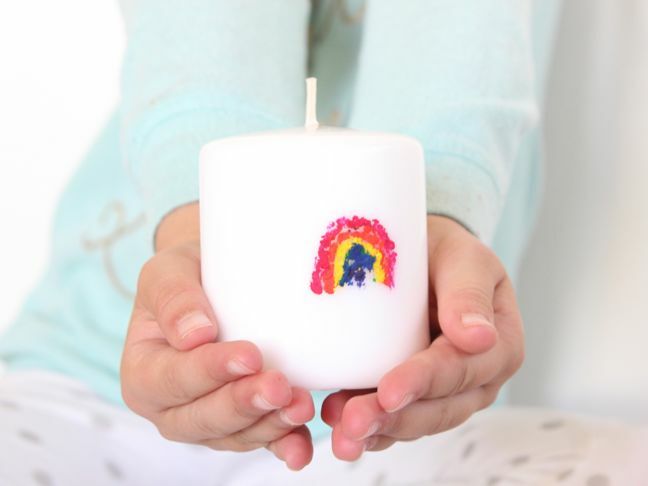 That is no longer the case because, armed with crayons and a blow dryer, the kids and I made DIY custom art melted crayon candles. 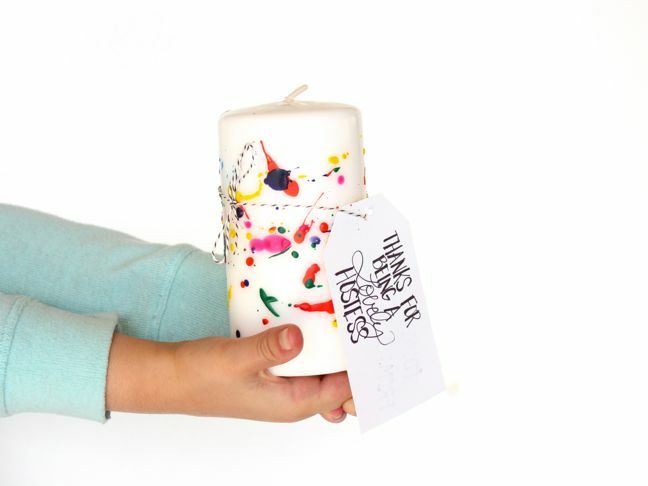 With candles as the canvas and the kids’ art on display, it’s sure to melt the hostess’s heart. Step 1: Peel the paper off the crayons. 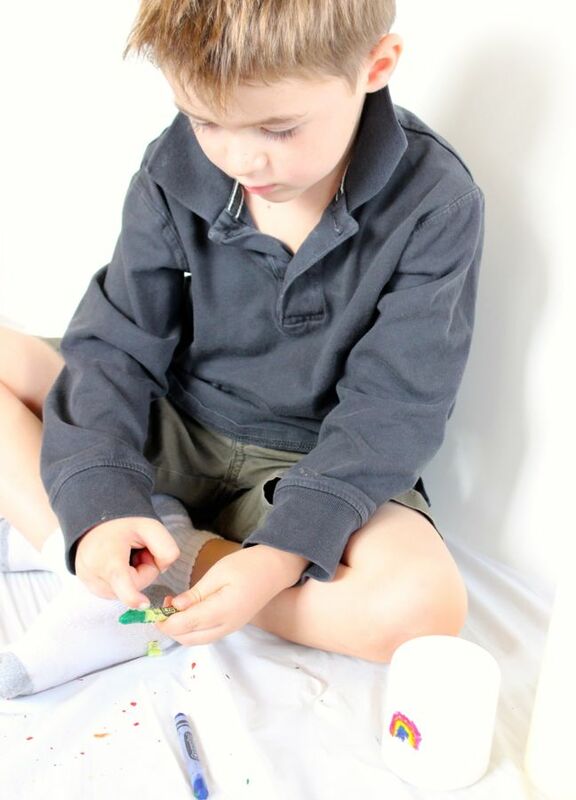 Kids love this assignment; plus, it’s a great fine motor activity. Step 2: Place a candle on a disposable tablecloth. Make sure you’re close to an outlet so you can plug in the hair dryer. 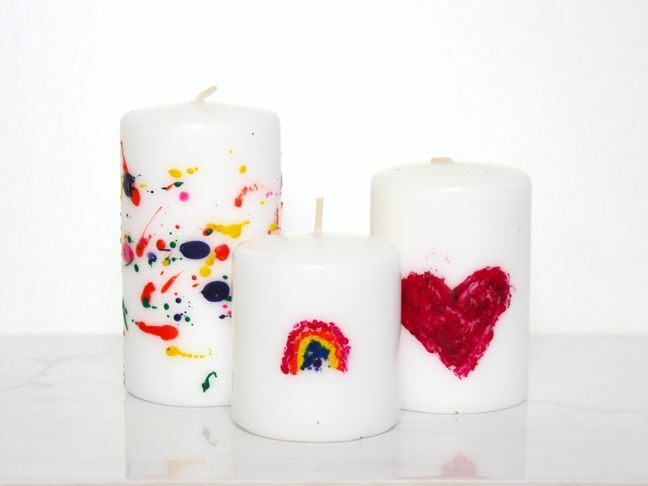 Step 3: Create art on the candles. Because it’s a wax-on-wax craft, there is no glue necessary. Hooray—the wax sticks to itself! 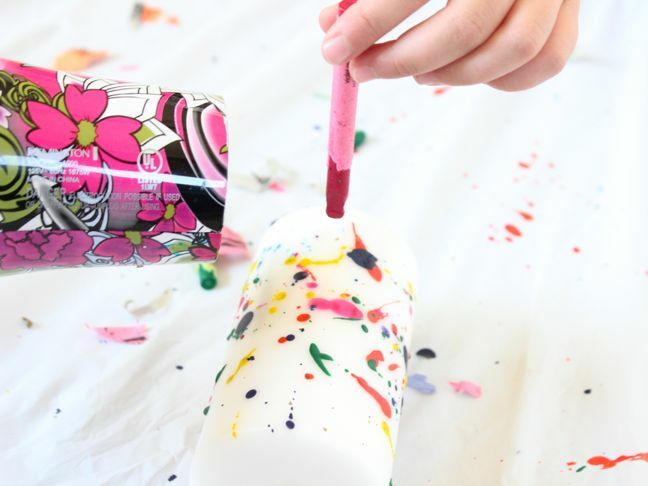 There are a couple ways you can do this—either splatter the melted crayon wax or draw with it. 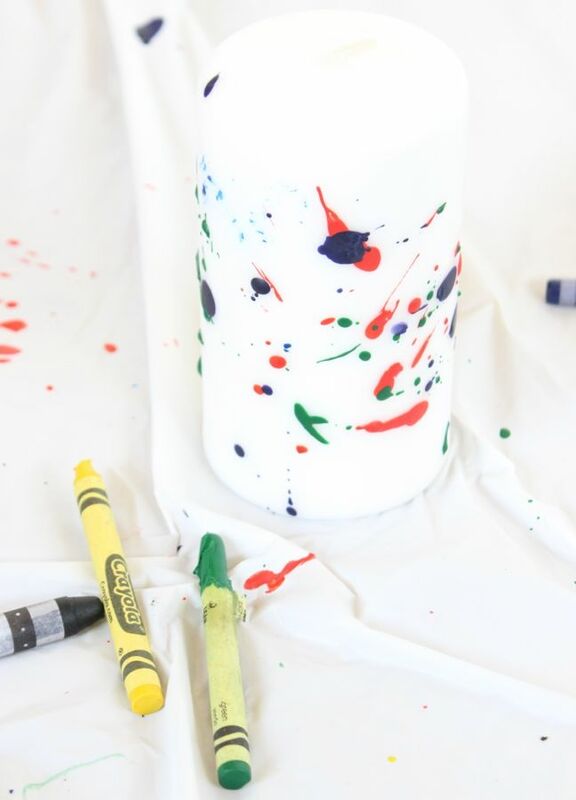 For the splatter effect, hold the crayon above the candle and heat it with the blow dryer. Melted crayon droplets will fall onto the candle. 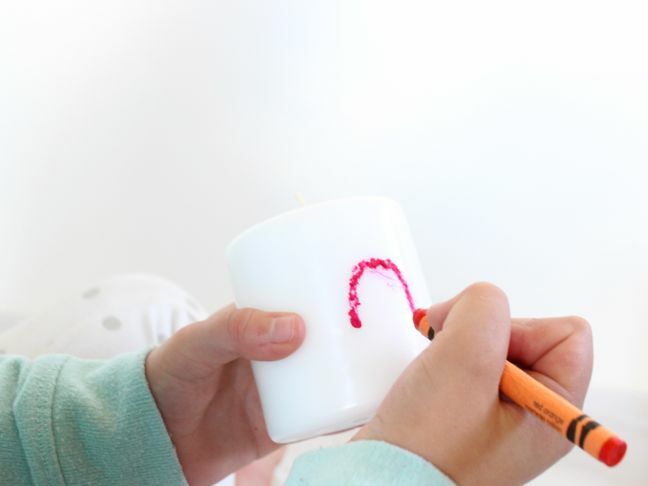 If you turn up the volume of the air, the crayons will melt and blow onto the candle. 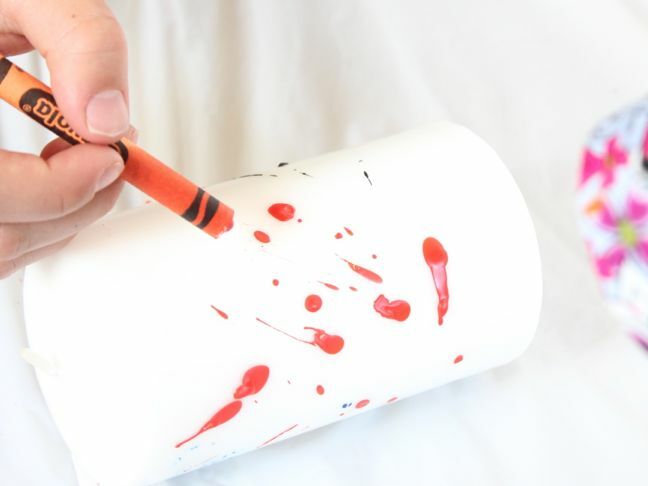 Another way to do it is to heat the crayon and then make a quick whip of the wrist with the crayon in hand (the same way you would flick paint from a paintbrush onto a canvas). To draw an object, you will need to repeatedly heat the crayon with the blow dryer. 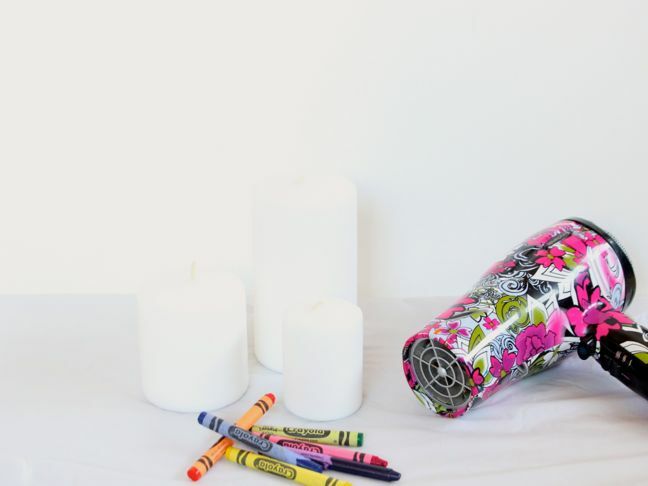 The lighter the pressure as you press the crayon on the candle, the better it appears on the candle. In fact, dabbing the crayon is best. My daughter made the rainbow, so she worked little by little to make it as we reheated the crayon. 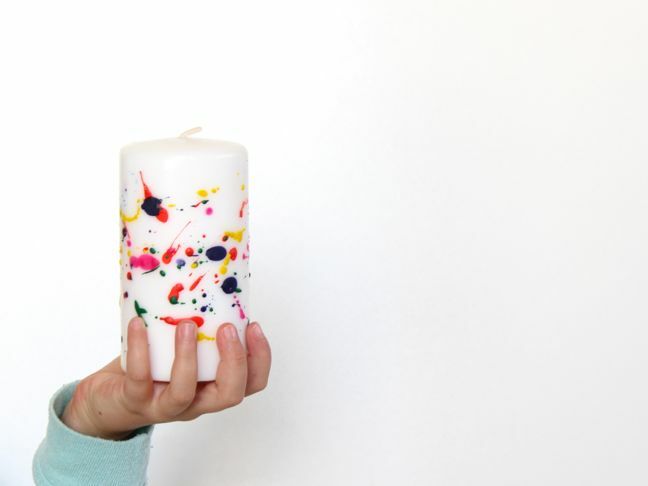 For the heart, we continuously heated the crayon and dabbed it on the candle until it was all filled in. Note: We found that black crayons work best to write text. Also, we discovered that the easiest thing for kids to do is draw a small object or make splatter crayon art. We tried to write “Home Sweet Home” with crayons, and my kids lost their patience. For an adult, long phrases would work with darker crayons. Step 4: Attach a cute tag and give, give, give. This makes for a wonderful DIY hostess gift year-round. Think about the potential for Mother’s Day and gifts for special friends throughout the holidays.